The one I own is about 30 years old. The American made, carbon steel model. 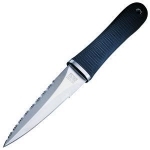 Wonderful knife, a little heavy, but that is what I wanted in an out door knife. Lots of wear and tear and never a problem. It has been replaced by a Buck 119, only because I can not replace it and do not want to loose it. 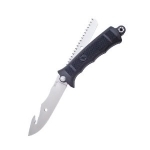 This is another good blade for the outdoors. Its a full tang fixed blade made out of 7CR17 stainless. It has Derlin handles, brass finger guard and its built to last. It comes with a leather sheath that holds the knife well, its not very pretty but it looks that it will last as long as the knife. 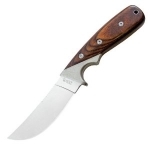 It has an upswept blade design that I like with a nice belly. Its easy to sharpen I usually use a 25 angle to sharpen this one. It has a very classic look that I also like and has some heft to it. Its a good knife for the price. It reminds me of the American Frontier.